This Norfolk man in his early twenties came in to discuss his concerns following an abdominoplasty performed by a New York surgeon. Prior to his tummy tuck he had lost about 70 pounds. Since that time he has been bothered by extra skin and fat on his sides that were not addressed with the abdominoplasty. 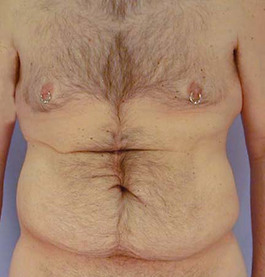 I discussed with him that Liposuction would be the best option for removing the fat on his sides; however, he had extra skin and wanted a more dramatic change. He was willing to accept more scar trade-off. 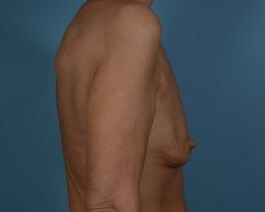 Therefore we performed a flankplasty, combining liposuction and a large amount of skin excision. We can see from the before and after photos, the dramatic change when these procedures are combined. 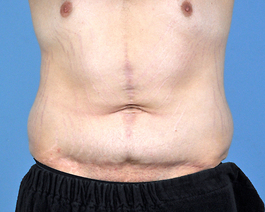 Unfortunately we cannot put the scar as low as we would like because his previous tummy tuck scar was placed high. For patients who are apprehensive about the long scar, it is reasonable to just have the liposuction and see if the skin will shrink. A flankplasty can always be done later for excess skin removal.